EFI conversion? Oh yeah. 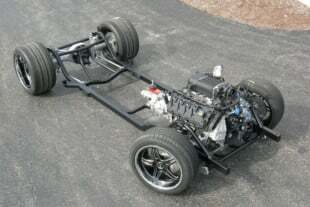 LS or Coyote swap? Even better. Like most things in life that seem too good to be true, two of the most appealing engine mods in the book require upgrading to a high-pressure fuel system. While injecting fuel particles with electronic precision brings the promise of enhanced driveability, idle quality, mpg, and cold-start performance, it also brings the curse of dropping the gas tank, running new lines, and installing a high-pressure pump and regulator. After all that hassle, fuel slosh and pump starvation are always a concern. Suddenly, carburetor backfires and fouled-up spark plugs don’t seem so bad anymore. Someone stop the madness! In the 50 years Dooley Cameron has owned his ’55 Chevy Nomad, it’s evolved from Pro Street to Pro Touring. 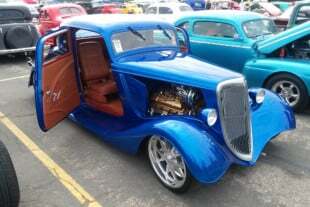 In 2011, he replaced the tired 350 small-block and TH350 combo with a carbureted 625hp LS7 and a six-speed stick. After putting up with cold-start headaches for the past six years, he decided it was time to ditch the carburetor for an Edelbrock E-Street 2 EFI conversion kit. Ask and ye shall receive. Thanks to Edelbrock’s ingenious Universal EFI Sump Fuel System Kit, the madness has officially ended. What looks like an ordinary auxiliary fuel cell actually houses a high-pressure fuel pump, regulator, and inlet and outlet fittings all in one self-contained unit. 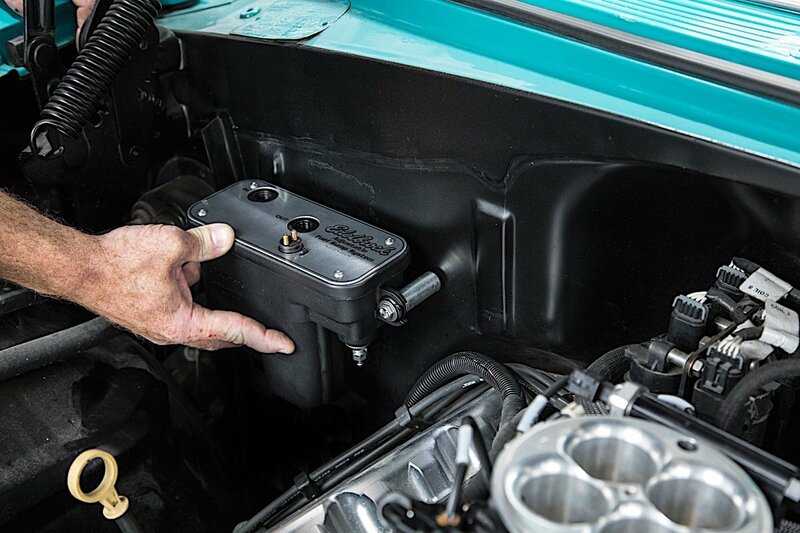 With Edelbrock’s nifty fuel sump cell mounted under the hood, converting a low-pressure carbureted fuel system to a high-pressure EFI system is as easy as connecting the existing feed line to the cell inlet, then routing a new high-pressure line to the fuel rail. That’s it. No need to run a return line, baffle the fuel tank, weld on a sump, or worry about sucking the pump dry whenever the fuel level runs low. That’s not too shabby at all for under $400. Here’s how it works. 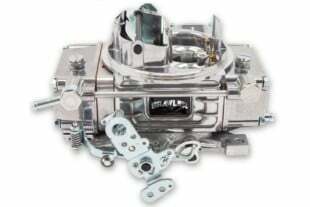 Edelbrock’s Universal EFI Sump taps into the low-psi fuel system on any carbureted engine, then boosts line pressure to the 43-plus psi that today’s EFI systems require. This arrangement allows a car’s low-pressure fuel system to remain completely intact. Once the Edelbrock fuel system has been installed, the existing feed line is simply re-routed from the carburetor inlet to the Edelbrock Fuel Sump inlet. Consequently, the only purpose of the low-pressure fuel system is to keep the Edelbrock Fuel Sump topped off. High-pressure fuel then exits out of the Edelbrock Fuel Sump outlet, and into a new feed line that attaches to the fuel rails. Sometimes the simplest solutions are best. Edelbrock’s newly released, second-generation Universal EFI Sump Fuel Kit (PN: 36031) includes a fuel sump tank, pump, adjustable pressure regulator, plug-and-play harness, fuel hose, filters, mounting brackets, and fittings. All this for under $400. Compared to Edelbrock’s first-generation Universal EFI Sump Fuel Kit (left), which was already very compact in size, the second-generation system (right) measures four inches shorter and 1.25 inches shallower in depth. The first-gen system’s non-adjustable pressure regulator has been upgraded with a fully adjustable unit that can vary pressure between 35-90 psi. To top it all off, the second-gen system costs $200 less than the system it replaces. Since stuffing a big, bulky fuel cell under the hood can be challenging, Edelbrock designed its L- shaped sump to be as compact as possible. Measuring 9 inches tall, 10 inches wide and 3.75 inches deep, the cell is easy to fit in even the tightest of spaces. Like a welterweight prizefighter, the Edelbrock Universal EFI Sump Fuel Kit packs a big punch despite its compact size. Equipped with a high-flow 67 gallon-per-hour (255 lph) fuel pump, the system can support up to 600 horsepower. Any way you slice it, by piggybacking a high-pressure fuel cell/pump combination onto a low-pressure carbureted fuel system, Edelbrock’s all-in-one solution makes upgrading to an EFI fuel system ridiculously easy and affordable. Although the bypass pressure regulator is mounted inside the Edelbrock fuel sump, it’s readily accessible from the outside for easy pressure adjustments. This location eliminates the need to run a return line from the fuel rail back to the cell. Compared to deadhead-style fuel systems, bypass regulators react more quickly to pressure fluctuations, thus stabilizing fuel delivery. The molded plastic cell is both durable and lightweight. It attaches to just about any solid surface using three mounting ears integrated into the outer edges of the sump. If the sump must be installed on a surface that isn’t completely flat, this arrangement makes it easy to line it up in the correct position by varying the length of the spacers and bolts. The top of the Edelbrock’s Universal EFI Sump Fuel Kit has just three connections: two for the fuel inlet and outlet, and one for the wiring harness. It’s a testament to just how easy it is to install the system. Short and fat at the top, yet tall and skinny at the bottom, the Edelbrock fuel cell features an integrated sump that keeps the pump submerged even under the most extreme acceleration, braking, and cornering loads. Mounting the pump inside the tank substantially reduces noise as well. Arguably one of the most proven in-tank fuel pumps on the market, the Edelbrock fuel system utilizes a proven Walbro GSS342 pump to ensure rock solid reliability. The Walbro’s gyrator design continues pumping out lots of flow even at elevated line pressure. The Edebrock cell functions like a giant fuel bowl that houses a high-pressure fuel pump and regulator. Just like a carburetor, the cell utilizes a needle-and-seat assembly and floats to keep the fuel level topped off automatically. The fuel pressure regulator features a vacuum-reference port that can compensate for changes in manifold pressure. This is particularly useful in forced induction applications. The vent on the second-generation fuel sump has also been relocated to the bottom of the tank for a cleaner appearance. Those that don’t like reading instruction sheets will appreciate the fuel sump system’s 2.5-page instruction manual, half of which are comprised of helpful diagrams. Dooley and Sons’ technicians finished the job in less than two hours. Any DIYer should be able to pull it off in a single leisurely paced afternoon. Even after bolting the Edelbrock fuel sump to the passenger side of the firewall, there’s still plenty of room to spare for other accessories if necessary. This location tucks the cell away from heat sources and moving parts. Technicians bolted the fuel sump in place using one-inch spacers and 5/16-inch bolts. Before any wiring modifications can begin, the battery must be disconnected. The fuel sump kit plugs right into the fuel pump connector that comes with the Edelbrock E-Street 2 EFI system. For late-model engine swaps, or EFI conversion kits that do not have a dedicated pump relay, Edelbrock offers a standalone fuel pump relay harness (PN: 36054). The Edelbrock fuel cell can be fed by either a mechanical or an electric low-pressure fuel pump. Cameron’s Tri-Five utilizes an electric pump, and a feed line routed along the passenger-side floorboard and into the engine compartment. Dooley and Sons’ technicians cut the existing feed line, then secured a carb-style plastic filter to it with hose clamps. Positioning the filter on the inner fender allows for easy access. With the Russell Twist-Lok -6AN fittings secured to a padded vise, spraying the barbs down with soapy water makes attaching the hoses a simple push-in affair. No wrenches required. After cutting the hose to length, one end was attached to the plastic fuel filter, and the other end to the fuel cell inlet. The trick to installing the inlet and outlet fittings is tightening them by hand until the hex portion contacts the sump lid. They should then be tightened another 1/6 of a turn, or from the 12 o’clock to 2 o’clock position using a ¾-inch wrench. Under- or over-tightening the fittings can cause leaks or permanent damage to the sump threads. The high-pressure feed line was routed from the fuel cell outlet, along the top of the passenger-side valve cover, and finally to the throttle-body fuel rail using a 45-degree -AN fitting. Different fittings may be required depending on the packaging needs of each application. Edelbrock strongly recommends using filters on both the fuel cell inlet and outlet lines. The steel filter taps into the high-pressure line with a pair of hose clamps. Dooley and Sons attached the filter to an existing hole in the intake manifold. Like many classic cars, the ’55 Nomad does not have a charcoal canister. As such, the fuel cell vent (left) must be connected to the vehicle’s fuel tank vent, or back to the fuel tank itself for safety reasons. A length of hose was routed from the vent barb on the Edelbrock fuel sump to the existing fuel tank. A vacuum hose (right) was also routed from the pressure regulator to a vacuum port on the throttle body. With the installation complete, the final plumbing of the Edelbrock Universal EFI Sump Fuel system is remarkably simple. Everything is within reach and easy to service. Filling the Edelbrock fuel sump system for the first time involves reconnecting the battery, then unplugging the fuel pump power connector on the fuel cell. This ensures that the high-pressure pump is not running before the low-pressure pump has sufficient time to fill up the fuel cell. The first step involves cranking the motor for 10 seconds. Next, after returning the key to the “Off” position for 30 seconds, the motor must be cranked for 10 more seconds to complete the fill procedure. After re-attaching the fuel pump power connector, Dooley and Sons technicians turned the key to the “On” position to pressurize the system, then checked for leaks along the high-pressure lines, low-pressure lines, and the fuel rail. With the subtle hum of the pump confirming it was priming, the big LS7 fired right up. Adjusting the fuel pressure is as easy as loosening the jamb nut with a 9/16-inch wrench, then turning the adjuster nut with a 7/16-inch wrench. Edelbrock recommends running 58 psi of pressure with the E-Street 2 EFI system. After earning a B.A. in journalism from California State University Fullerton, Stephen Kim worked as a staff editor at Hot Rod magazine before pursuing a full-time freelance career. Now based in Houston, Texas, he provides high-quality photography and writing services for the most well-respected editorial outlets in the automotive publishing industry. Some day, he hopes to finish transforming his 9-second Fox Mustang into a 7-second street/strip terror. In the meantime, he enjoys racing his 125cc CRG Road Rebel shifter kart.